I don't know if I can call RAW (read results here) a good show or not, really. I mean it was the site of the Superstar Shake-Up and the crowd was hot for sure. But at the same time, there were some issues with the overall scheme of things. There was much I did not really care for. And therefore, as always, I shall separate the best from the worst, and serve you my post-show recap. I invite you to leave your comments and thoughts in the section below and let me know if you enjoyed the show or not. I'm curious to know what you thought of the superstars who changed brands this week. Also, would you rate this show as a thumbs up or a thumbs down? I am torn about it myself, so I thought I'd ask you guys. Anyway, here's what I thought of the show, personally. I really do think that while SmackDown was synonymous with The Phenomenal One, he had nothing else to prove on the blue brand. By arriving on RAW, he has a fresh set of opponents that he can square off against and put on incredible matches with. 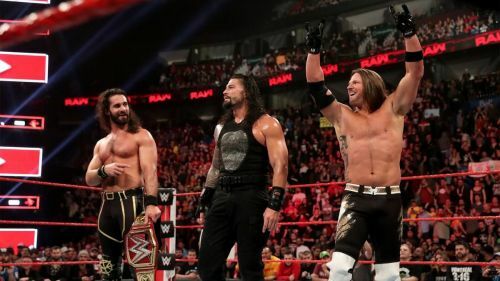 One of those men is the Universal Champion Seth Rollins himself and fans who enjoy the art of in-ring action will be thrilled at the possibility of these two men taking each other on down the line. Both men are really good in the ring and could put on a match for the ages. In a lot of ways, Styles was the stand-in for Dean Ambrose on RAW this week, which was a very strange sight. If Reigns doesn't move to SmackDown Live, could WWE reform a new Shield with The Phenomenal One?